RHS Consulting Design, LLC is a Small Business Enterprise certified by the Department of Administrative Services and is on the pre-qualified list to provide engineering services for the Connecticut Department of Transportation. RHS Consulting Design, LLC was founded by Rifat Saleh, PE in 2003 and incorporated in the State of Connecticut in 2005. Rifat is a licensed professional engineer in the states of Connecticut, New York, and Florida. 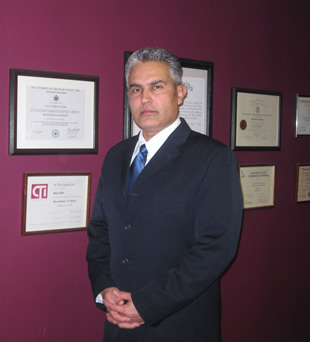 Mr. Saleh has managed and served as a Chief Structural Engineers on a variety of bridge and structure design projects for ConnDOT, MHD, RIDOT, NYDOT, Mass Turnpike, and various municipal clients. Currently, as a professor at University of Hartford, he teaches structural engineering courses in the engineering department. Furthermore, he also serves as a Structural Engineer Specialist with Urban Search and Rescue of Connecticut, TF-1 as part of Homeland Security Task Force. Mr. Saleh has been in the business since 1984, providing years of experience encompassing highway and railroad bridge design, building design, inspection and condition evaluation of existing bridge and building structures, load rating analysis for legal and permit loading on structures, improvement proposals, cost estimates, repair and maintenance procedures, bridge rehabilitation, seismic screening and evaluation, PONTIS data entry, fatigue and fracture critical member identification. His structure design and construction experience covers a variety of steel, Cast-in-place concrete, prestressed concrete structures, post-tension concrete box girders, multi-girder system, girder-floorbeam-stringer system, steel box girders, rigid frames, concrete spandrel arches and steel truss structures. Mr. Saleh has attended various bridge design/inspection training programs including the FHWA Bridge Inspector 90 Training, Inspection of Fracture Critical Members and fatigue Prone Details, Non-Destructive Testing, LRFD Design for Highway Bridges, seismic analysis and design of structures, cofferdam and temporary sheet piling, and other geotechnical seminars. RHS Consulting Design, LLC provides a team of dedicated senior professional engineers, who have successfully completed a variety of projects. Our staff excels in the use of various civil engineering computer software including AutoCAD and Microstation. We have established a firm that has over 100 years of combined experience. Our staff is certified by the National Bridge Inspection Standards (NBIS). RHS is responsible for the design and construction of roadways, facilities, bridges, arches, turntables, carhoists and bodystands for railroad maintenance facilities, and modeling of special structures. This firm specializes in condition survey and evaluations of bridges, and load rating analysis for various structures. Established in 2003, RHS Consulting Design, LLC is advancing toward innovative building, incorporating inspiration with the experience and reputation needed to provide our clients with prompt delivery and satisfaction. Client relationships are vital; we believe that no job is complete until every client is satisfied. We always take the proper steps to ensure every accommodation has been made. We are moving swiftly in executing the proper requirements to expand our client base and branch out our services to meet our client’s expectations. We are constantly evolving to provide our services and fulfill the needs of both local and international clients and corporations. RHS is broadening our horizons to further expand our visions and prepare for the future. We have great expectations for the 21st century as we continue to provide excellence throughout the industry.